Who provides services at the Student Health Clinic? U of I contracts with Moscow Family Medicine to provide medical services at the Student Health Clinic, 623 South Main St., on the northeast edge of campus. The clinic offers a full range of primary and preventative care. Services are available to all students regardless of the type of health insurance coverage they choose. The clinic is a participating provider with many private health insurance programs and electronically bills most major insurance companies. You and your dependent family member’s health care needs will be met with a full range of primary and preventative care and referral services. Students may be treated on site or referred to an appropriate specialist, such as an orthopedist, gynecologist, dermatologist, etc. The Student Health Clinic is a participating provider with most private health insurance programs covering U of I students, including all Blue Cross and Blue Shield programs. Moscow Family Medicine electronically bills most major insurance companies. Insurance programs and deductibles vary. Confirm insurance coverage with your carrier prior to receiving any service at the Student Health Clinic. Visit the Student Health Insurance site for more information on SHIP. Before stopping in, schedule an appointment by calling 208-885-6693. Many appointments are available the same day. You must present your VandalCard at the time of each appointment. To cancel an appointment, call 208-885-6693 prior to your scheduled time. Students who miss a scheduled appointment may be charged a $25 fee billed to the student. 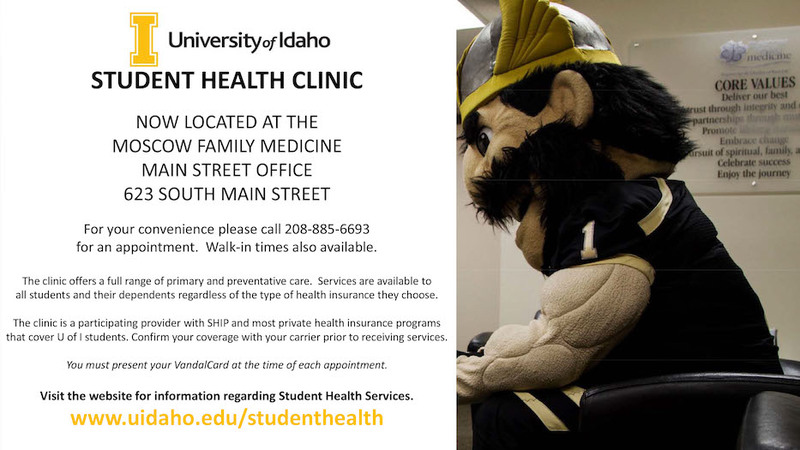 The Student Health Clinic is located on the northeast edge of campus at 623 S. Main St.
For a downloadable map, please click here. Is there transportation to and from the clinic? Yes. Transportation from any on-campus location to and from the clinic is available through the Vandal Access Service. Call 208-596-3722, a minimum of 2 hours before you will need a ride. Return trips to campus post-appointment will be provided upon request and as soon as possible. What if I have an urgent health care need? If at any time you are experiencing a life-threatening condition, immediately call 911 or go to the nearest emergency room. Yes. Providers are available 24 hours per day for urgent or critical health needs that do not require an emergency 911 phone call. Call the Student Health Clinic at 208-885-6693 to be connected with our on-call physician. Insurance may pay differently for services received off-campus and outside the Student Health Clinic. If at any time you are experiencing a life-threatening condition, immediately call 911, or go to the nearest emergency room. There is no need to dial 8 if calling from a campus phone, simply dial 911.